BEIJING - When Starbucks came to China two decades ago, it promised to open a new store every 15 hours. Now a homegrown rival, Luckin Coffee, plans to build a high-tech shop every 3½ hours to dethrone the U.S. giant. 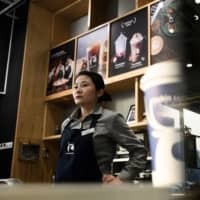 The Chinese upstart is burning through millions of dollars to lure customers with steep discounts, challenging Starbucks’ dominance by targeting office workers and students who prefer to have their java on the go or delivered to their doorstep. The shops often are no bigger than a studio apartment, with no tables, display counters or even cash registers because all payments are made using mobile phones. Luckin’s no-frills approach means customers pay about a third less for a cup compared to global brands. A tall latte costs 31 yuan (around $5) at Starbucks but only 24 yuan at Luckin. Customers who walk into one of Luckin’s blue-and-white outlets need only spend a few minutes there to scan a code and pay for their coffee, which has been pre-ordered through the company’s smartphone app. “The big advantage for us of having pickup stores versus the big stores is that in terms of rental costs, we pay significantly less than our competitors,” said Luckin’s chief strategy officer, Reinout Schakel. After only a year in business, the company announced plans this month to open 2,500 outlets by the end of the year, which would push its total store strength to 4,500. By comparison, Starbucks has some 3,600 stores across the country. 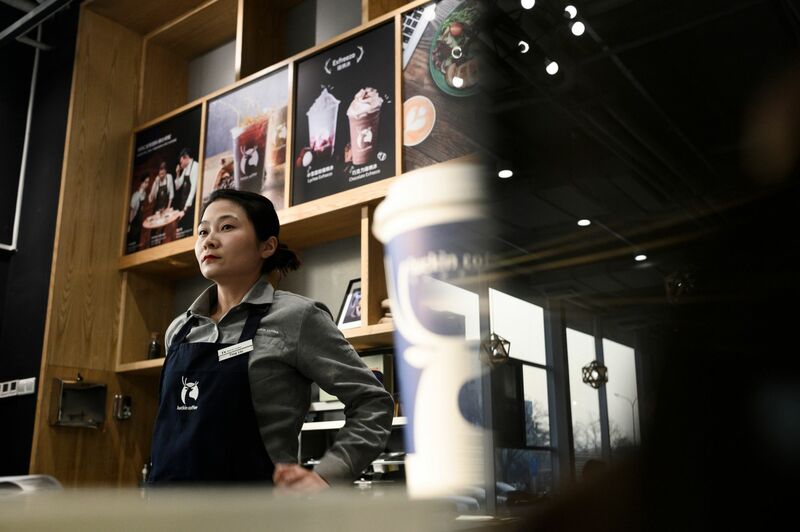 The U.S. behemoth has an 80 percent stake in China’s $3.4 billion coffee-shop market, according to research group Euromonitor. Chinese consumers currently drink just four to five cups of coffee per year, compared to about 300 cups in Japan or South Korea, which were also traditionally tea-drinking markets, he said. After the United States, China is Starbucks’ fastest-growing market and its second-biggest. Its Reserve Roastery in Shanghai, which opened in late 2017, is the company’s biggest store in the world. “Our delivery service today covers more than 2,000 stores across 30 cities, within three months of its launch,” said Derek Ng, communications director for Starbucks China. But the U.S. chain has recently started doing discounts, Hu said, adding that the coffee rivalry reminded her of the discount wars between Uber and its local rival Didi Chuxing, which later dislodged the American ride-hailing giant from the Chinese market. Schakel — who is also Luckin’s chief financial officer — says the startup can afford to burn money to grab market share over the next few years. “Are we competing with Starbucks? Probably to some extent. We don’t care whether the demand is coming from new coffee drinkers or from Starbucks coffee drinkers,” he said. Luckin’s caffeine-fueled expansion has been funded by investors including Centurium Capital, a private equity fund founded by the former China head of Warburg Pincus, and GIC, Singapore’s sovereign wealth fund. The company raised about $400 million in two rounds of funding last year and says it has been valued at $2.2 billion, making it the first coffee unicorn — a privately held startup worth over $1 billion — to come out of China. Schakel declined to comment on rumors that Luckin is seeking a listing on the Hong Kong Stock Exchange.